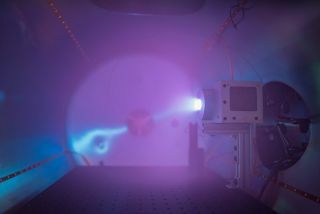 A Phase Four plasma thruster in testing. The small thrusters could one day power interplanetary spacecraft. Electric thrusters for spacecraft are increasingly shrinking, and could prove key for new space missions. And, according to two novel space tech companies, Phase Four and Accion Systems, they might even go interplanetary. Conventional rockets that rely on chemical reactions "are a great way to generate a lot of thrust, but they are very inefficient when it comes to generating thrust given the amount of propellant they carry," Simon Halpern, founder and CEO of space propulsion company Phase Four in El Segundo, California, told Space.com. "That's why launching even a small satellite requires a gigantic multistory rocket." Electric propulsion generates much less thrust than chemical rockets, too weak to launch a spacecraft from Earth's surface. However, electric propulsion is far more efficient than chemical rockets, making it potentially very useful where every bit of weight matters, such as with a spacecraft once a conventional rocket carries it to orbit. "There's a lot of money going to launch companies, but once spacecraft are in space, they need to be able to get around, to explore the inner and outer planets of the solar system if need be," Halpern said. Electric thrusters have propelled spacecraft for decades. For example, in the 1970s, the Soviet Union started including so-called Hall thrusters on satellites. Hall thrusters use electric and magnetic fields to convert neutral atoms in a gas such as xenon into charged particles called ions, and then use electric fields to accelerate clouds of ions known as plasmas outward to generate thrust. These thrusters remain the most common type of electric thrusters on spacecraft. However, "while Hall thrusters show good performance, they're rooted in technology designed in the '60s and '70s," Halpern said. "So you end up with really big, bulky systems." Now, Phase Four has developed "the smallest plasma-propulsion system available today," Halpern said. "We want to help put a spacecraft in orbit around every planet, every moon, every day." Instead of using large high-voltage electronics to generate plasmas with electric and magnetic fields, Phase Four's thrusters use smaller, lower-voltage components to generate plasmas with radio waves. "The same way a microwave oven uses microwaves to excite water molecules in food, we use the same kind of electronic parts you might find in a cellphone or a wireless electric charging mat to produce radio waves that can energize a plasma," Halpern said. "Xenon is the propellant most often used for electric propulsion, but we're also looking at air or water." Phase Four's thrusters direct the electrons in the plasma outward using magnetic fields, either from permanent magnets or from electromagnets. The ions in the plasma follow the electrons outward, giving the plasma an overall neutral electric charge. One disadvantage of previous electric thrusters is how they need to neutralize the electric charges of their plasmas as they blast into space, or else the spacecraft would build up huge, dangerous electric charges, Halpern explained. These neutralizing components are typically prone to failure over time because they need to be immersed within a thruster's exhaust plumes. In contrast, Phase Four's thrusters generate plasmas with an overall neutral electric charge, and so neither need to neutralize their plasmas nor carry failure-prone neutralizing components, Halpern said. In May, Phase Four announced it sold thrusters to NASA so the agency could test their capabilities for satellite propulsion, as well as to imaging satellite firm Astro Digital in Santa Clara, California. "We see this as verification by the government and commercial industry that we have something people want," Halpern said. Halpern described Phase Four's work on June 2 at the Dawn of Private Space Science symposium at Columbia University in New York. A "thruster chip" designed by Accion Systems is smaller than a quarter. Thirty-six of these chips working together make up Accion's TILE engine. Another new kind of electric-propulsion technology uses dime-size thrusters for spacecraft. "The aim is to use our technology for the colonization of other planets, and maybe probes to another star," Natalya Bailey, founder and CEO of Accion Systems in Boston, told Space.com. Electric thrusters often rely on compressed gases stored in bulky pressurized tanks, as well as large chambers in which to ionize those gases, and pipes, valves and pumps to shuttle those gases around. Instead, Accion relies on a salty liquid propellant, which helps significantly reduce thruster size and simplify design. "We're bringing the capabilities of more traditional ion engines down to the size and power levels of small satellites," Bailey said. Accion's chip-size thrusters, each known as a TILE (Tiled Ionic Liquid Electrospray), relies on capillary action to help liquids flow inside them — capillary action forces liquids to flow through narrow pipes, and is the same effect that helps draw water up trees. Each TILE then uses electric fields to draw ions from the propellant and funnel them into beams out of microscopic nozzles. Accion's initial goal is to help give even tiny satellites the means to propel themselves and thus correct their positions within their orbits around Earth. This can help them stay in orbit much longer so that satellite owners get more value for their money. "We're opening up mission types for small satellites that they previously didn't have," Bailey said. The methods used to fabricate microchips can be adapted to help mass-manufacture Accion's thrusters, which helps reduce costs. "In the long term, the reason we founded our company around this technology is because it is the most scalable of any electric propulsion system out there," Bailey said. Accion's thrusters are scheduled to fly on three spacecraft in 2019, Bailey said. The first spacecraft will be a cubesat from Irvine High School in California. "We're going to higher and higher performance levels, and eventually plan to go to bigger satellites and then interplanetary missions," Bailey said.